sisu: "You don't get to be the same again"
"You don't get to be the same again"
No one expected to see dusk. What we expected was Mogadishu writ large. The Americans would win, that was indisputable. But we, the first in, embarked on it without expectation of survival. We prepared to make a good run of it, stripping soft gear off the outside of the Bradley that might burn if we got hit, loading up on water and ammo. Smitty, the Bradley's 20-year-old radio operator, was bounced to make room for a psyops soldier and the amplifiers that would blast the "surrender" messages. Smitty was angry . . . I was the only one in the company who had a choice in the matter. But the question of whether to ride with one's friends, when one has a job to do, when one has made a commitment, is not much of a question at all. There was heavy fire that day and for two days after. A lot of people died. But not us. We lived, and learned some of the many lessons that war has to offer. 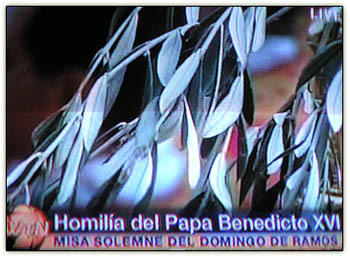 Olive branches (above), together with palm fronds, were the plants of choice during Palm Sunday rituals in St. Peter's Square. Iraq has become the central battlefield in the 21st century's Islamic war, and may have been destined to be, with or without us. Lying geographically, ideologically, and culturally athwart the Middle East, rich in resources and boiling with rage long before we got there, it is the place where the war will either be settled or truly begun. It is a fitting role for the cradle of civilization to host a war in which the very progress of civilization is being challenged. Saddam Hussein convinced the world he had active weapons programs. The evidence now suggests he didn't, but how active his programs were, ultimately, is irrelevant. He had demonstrated his desire to dominate the region. Our European allies were eager to do business with him despite their own intelligence reports. Absent any containment, there was potential for more terrible and far-reaching wars. It was inevitable that Iraq would undergo a post-Saddam power struggle with massive ethnic conflict and with interference by Iran and Syria. The question was, and remains, how much influence we would wield in that event. 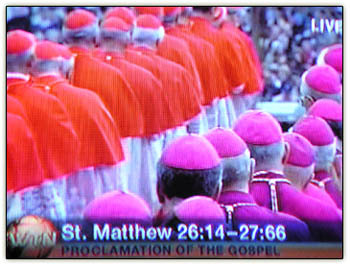 The sensuous splendor of Catholic ritual at its best trumps all other religious traditions out there, in our opinion. We simply cannot connect with religious traditions that just say no to the deeply human resonance of music and graphic representations of everything under the sun -- yes, you, Osama and Ahmajinedad -- and while ascetic traditions have their charms, nothing can beat Mozart's C Minor Mass or his "Lacrymosa" from Requiem for their awe-inspiring call to something far greater than ourselves. Not to mention Wolfgang Amadeus's "Ave Verum Corpus," the most ineffably, heartbreakingly beautiful piece of music ever written. We had the musicians play it at Mummy's memorial service, a perfect complement to our sister's sparkling tribute to "a most incandescent light." If I were to ask you what are the five Holy Nights, what would come to your mind? Perhaps nothing or perhaps something. The fact of the matter is that the Holy Days and Nights are not discussed very often among religious people in America. But for Muslims in America there are evenings that should matter in our lives, they should not be ordinary nights that pass in an ordinary way. There are five Holy Nights that I am going to mention here and if these nights mean something in the Heavens, then they should mean something to Believers on Earth. 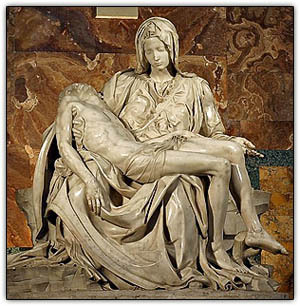 "You don't have to know anything about art -- or even the Bible -- to find yourself overwhelmed with emotion in the presence of Michelangelo's marble sculpture 'Pietà' (1498–99) in St. Peter's Basilica in Rome," we captioned this image in our December 2004 post "Lacrymosa," where we commented that "Jesus lies lifeless in the arms of his mother, Mary, after the crucifixion. The heaviness of her son's lifeless body weighs oppressively upon her, the angular lights and darks, ins and outs of the folds of her garment a muscular expression of her mental anguish." You might be interested to know that among American Christians this Holy Week is filled with celebration and contemplation of the meaning of the Passion of Christ. Nobody ever listens to anybody. It reminds us of the outrage of PBS listeners when the taxpayer-subsidized radio station had the gall to air the views of a handful of conservatives. Harummmph! Update: The Lord [of the Blogosphere] be with you. Planning for war is not like planning next fall's curriculum. All participants make misjudgements of the opponent's plans. But those who have the will to persevere and emerge the winner will control the future until the next war. War is one of the manifestations of human nature and periodically is inevitable. 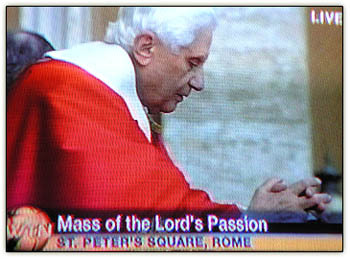 I had the fortune to see Pieta in 2006. I didn't understand sculpture until I saw that piece. I've always wondered if Muslims would look at it and feel the awe, and the peace that comes from standing there at the moment. It drove me into a side anteroom to pray. I don't know who said it - but the truism "all plans fail on first contact with the enemy" has certainly been as true in this war as in any other. It took a while and most annoyingly it took a "failed" election for the President to decide that maybe we should change tactics. *sigh* I wonder if anything at all would've changed if the Republicans had held control of the House and Senate. It took a shake up to make them move out of their rut and get things turned in the right direction in Iraq. Now they need to have another look at Afghanistan. No matter what the Pope prays - until the bad guys decide it's not in their favor to keep fighting - the killing won't end. If we retreat, it will only get worse. And Christians will pay the highest price of all. There is nothing wrong to praying for an end to massacres, nothing wrong to praying for an end to the violence. There is no tension between the US' military aims to support the elected, internationally recognized government of Iraq and the Pope's exhortation for an end to violence. Hopefully our troops do not hate Iraqis. It is counterproductive to victory for them to do so and certainly against national policy. We're not pro-violence, pro-massacre either so why the reaction against the Pope's prayer? He also pointed out that, if the enemy has only three available options, it is certain he will choose the fourth. "All military plans fail upon first contact with reality." - Diggs, General Staff, 4th Infantry Division, Baghdad. No enemy is needed for any military plan to fail. as-salaamu 'alaikum Sissy Willis. Thank you for the link. May God Almighty reward you for your good deeds, amin. Wishing all, you and yours, the mighty readers of the amazing SISU, a brilliant Saint Patrick's Day. Beannacht Lá Fhéile Pádraig !